This is getting a little silly, isn't it? Why can't they just tell us? Why this torment? The splash screen has been updated, and so has the "hidden" page source text. I recognize your pain. Your kind must learn it comes from straining against the turning of the world. It spins thus. You cannot stop it. One day, you will wake up. You will stop pulling. The pain will be gone. Until then, all your waking hours are suffering. Josh Sawyer also posted this picture on Twitter. Notice the snake thing poster. It's an anagram! There's a relatively new profile for Obsidian on Kickstarter (created in August). Obsidian Entertainment is a game development studio located in Irvine, CA. We were founded in 2003 with many former Black Isle Studios employees dedicated to producing high-quality role-playing games. We're most known for games like Star Wars: Knights of the Old Republic II, Neverwinter Nights 2, and Fallout: New Vegas. 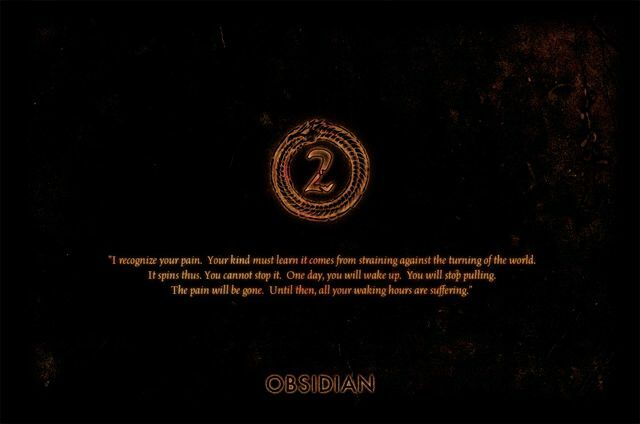 Prior to Obsidian, each of the owners worked for Black Isle Studios as production, design, management, and programming staff, having worked on the Baldur's Gate, Icewind Dale, and Planescape: Torment series.